The time for a paint job is finally upon us. The mechanical work was the first of the two jobs I’m having done by professionals, in the interest of time, safety and quality. This part took quite a bit longer than I had expected it to, due to an issue with the wrong part for the power steering being ordered twice. Some good, money-saving news came out of it though: the source of the fluid leak – one reason for replacing the power steering – turned out to be a hole in the old tube. Replacing that tube fixed the leakage, without needing a part that would have been upwards of $500.00 to replace. Almost everything other than that part was replaced, and I can feel the difference. The best comparison I can make between what it was before and what it is now is similar to a loose faucet. The steering wheel was stiff, and had a little bit of play before it decided to turn the wheels. Now, everything is smooth and a lot more responsive to input. The brakes had been replaced before the power steering, so while we were waiting for those parts to come in, I was able to bring the car home for the weekend to try to finish the radio wiring. The Pony still takes a while to reign in and come to a halt, but it’s certainly better than it was before. The general hooking-up-the-wiring part was pretty easy. 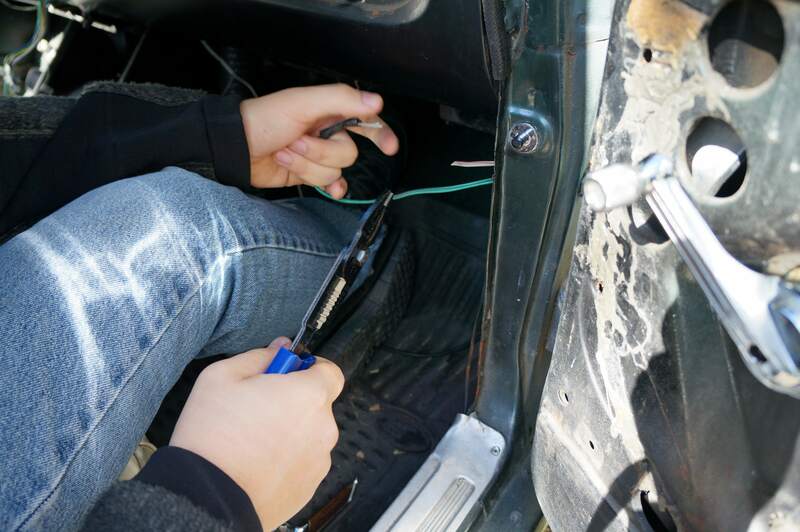 It was just a matter of cutting this wire, stripping it, connecting it to that one, and then on to the end coming out of the radio… but there were some unexpected issues. The first one had to do with the speaker cover. The new covers that came with the speakers are round and do not fit under the door panel. What I’m going to end up doing is using the old covers, which are square and fit perfectly. They’re in pretty good shape so I don’t feel I need to replace them. I only installed the left speaker, just to test it and make sure I hadn’t messed anything up in the installation process. Everything was hooked up, I turned the radio on, plugged in my iPhone and sound came out! It was a little muffled at first, but that was just due to some settings and knobs I had to change on the radio. The speakers seemed pretty loud, but I wanted to hear it with the engine running, as I would if I were driving along. I turned on the engine and put on some Eric Clapton. Then I closed the car door… and the music stopped. Fantastic! The radio works and sounds pretty good, as long as the doors are open. No problem, I’ll just drive with my doors open! Sarcasm aside, this was certainly an issue that needed to be solved. After a bit of troubleshooting, tweaking and hair-pulling, I traced the issue back to the power wiring of the radio. I had hooked the radio up to what I thought was a source of constant power, but it turned out to be connected to the dome light circuitry, which turns off when the doors are closed. What I know now is that there is no easy source of constant power that I can just connect to. I will either have to run a wire directly from the battery, or tap into the cigarette lighter, which has a short circuit problem. In other news, the car is about to go in to get a paint job from a local body-work guy named Ricardo, who comes highly recommended by a friend of ours. We did some comparison shopping, and Ricardo’s price is definitely the best, and the work we’ve seen of his is excellent. This is certainly going to be the most visually appealing part of the project. Nothing I’ve done so far has been cosmetic, and so none of it is really apparent yet. Body work will be obvious and impressive, and this is the part that I’m most excited about. The car’s going to be looking it’s finest when it gets back in a few weeks’ time. Ricardo has also offered to do some other body-work-related things, like replacing the dry, worn out seals, spraying some rust managing substances on the underbody and possibly replacing one piece of broken trim. Once all that’s done, I can get to work on the interior – replacing the seats, paneling, carpeting etc. The project finally seems like it’s coming together and it’s really exciting to think about what my finished product will be in two months!